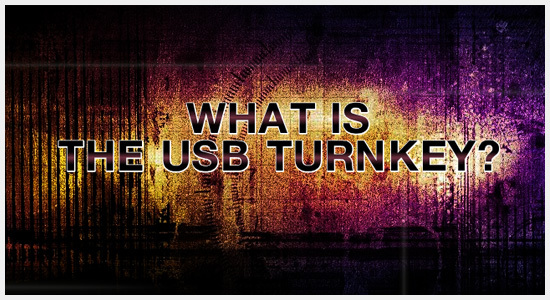 So what is the USB TurnKey? I am glad you asked. USB TurnKey is access. It’s a way to manage and control priveleged content. Earlier this year I wrote about our collaboration with Petrol Advertising, a motion graphics company we partnered up with to help us create a flash video presentation about our USB TurnKey solution. The video is all done and the solution hits the market this weekend. A little bit about the video. As I mentioned, it was put together by the good people of Petrol. We gave them a rough outline and they came up with the entire storyboard (excellent job, by the way). The voiceover was done by Karen Hutton, a long-time customer and friend. If you want the best VO on the market, she’s your woman. She also runs a website offering on-demand professional voice coaching, which can be found on VoiceOfBrilliance.com. This is probably one of the coolest projects I’ve worked on (at least so far this year). Earlier in the year, UTLX (Union Tank Car Company) came to us and asked for our help in designing a custom flash drive that looked like one of their train tank cars, the ones that transport liquids. With the words “Yes We Can,” we took the job. More than 10 design revisions, everyone agreed on the final piece. This was to be a plastic made USB drive with an embossed UTLX logo on both sides, with a USB drive spinning out from the bottom. It just arrived, and it looks B-E-A-UTIFUL. See photos below. You’ve been asking and we have been promising, so here it is. Just arrived (from the local recycling plant) is the True Green USB Drive. Unlike the ones that came before him, this USB drive is made out 100% recycled materials (recycled paperboard). It is engravable with your logo, or you can just write on it with a pen or pencil. Just don’t get it wet. While reading the Sunday Tribune, I glanced over the Best Buy ad section and saw that the new Lamb of God album, Wrath, was coming out on Tuesday. The price of the album was $24.99, but in addition to the standard CD and booklet, you would also get a limited edition USB drive with all songs in MP3 format and stems (bass, guitar, drums, vocals) playable in ProTools. The reason I know it’s limited edition is because we made those drives – all 10,000 of them. You can see the video showing the contents of the entire Wrath package http://www.youtube.com/watch?v=yp0Z_6dnLu8. Check back for details on more of our projects. Last Friday, Notorious (the movie) hit the big screen. On Tuesday prior, Catwalk Enterprises, a company handling PR and marketing for the film, contacted us with the usual request, ” We need 150 portable media players, printed with the Notorious logo and pre-loaded with an exclusive track from the upcoming feature, TOMORROW.” Done! The next evening, our shipping department was working on packaging the printed players and arranging address labels. The players were to be used as exclusive viewing premiere invites. The address list included Ashton Kutcher, Danzel Washington, Will Smith, and Jay-Z. About a year ago, Benchmade Knife Company came to us with a request to make them “the first 50 state legal bali-song” butterfly knife. We did just that. In early 2008, Benchmade added to their collection a 2GB USB drive (a limited run of 3000 pcs) in a shape of their signature bali-song knife design. The knife/USB is available for purchase http://www.benchmade.com/products/product_detail.aspx?model=985215. It has been featured on various blogs and tech sites including Gizmodo. Nice to be back home from CES. So many interesting concepts in the work, with Samsung leading the way (or at least that’s what their booth tricked me into thinking). For us, we are always working on something new and cool. As I mentioned before, we have partnered up with Petrol Advertising where they are making us a hot, graphic intensive video presentation for our USB TurnKey Solution and in return we are building them a USB drive in a shape of a gas pump. We are finished with the proof and are waiting on approval from Petrol. In the meantime, you can see photos of the actual USB drive below. This info is a bit outdated, but Luis Eslava, an industrial designer out of Spain, just placed his second order for the Virgin Mary Custom USB Drive. It all started in late 2006 when Luis (ABR Produccion) came to us with a strange request. “Can you make me a Virgin Mary USB drive,” he asked? The answer was, “of course we can.” A few back and forth emails and we had ourselves a CAD file with the finished design of the new drive. I think this was one of our first trully custom orders, certainly the first 3D custom drive. The body of the Oh Maria USB drive is made out of clear plastic with a solid gold plastic halo with an inscribed “Oh Maria Keep My Data Safe.” The LED light is located in the center and lights up when the USB drive is plugged in. The base and the clear dome packaging is also custom made. This drive demonstrates out plastic molding capabilities perfectly. Tooling cost to produce something similar ranges from $2500 to $5000, depending on complexity. Body can me made from any translucent color plastic or can be pained with any Pantone color (rubber or glossy paint). I hope everyone had a nice holiday break. I wanted to let you know about new things that happened at CustomUSB in December. We’ve updated our website. New products and solutions are available. 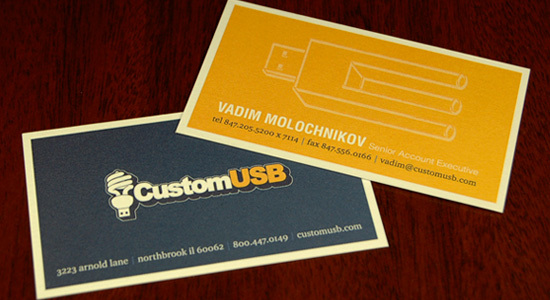 We are shifting our focus from the standard USB products to our ability to create any custom shaped USB drives, thus the new slogan – “Custom (Anything) USB.” See for yourself, CustomUSB.com. Down the same path, we are working with Gatorade, Taco Bell, and UTLX and are helping them create completely custom USB drives that resemble their products. I will have pictures soon. We just received new business cards (featured above), designed by yours truly. Let me know if you like them. Earlier this year we sponsored the Urban Network Music Conference and as a result I was asked to be on a panel at the Chicago Urban Music conference that will be happening next summer. We are also working on an ad design for the Urban Network Magazine. We have teamed up with Petrol Advertising and are producing a custom gas pump USB drive for them. In return, they are building us a video presentation to showcase our VIP KEY solution. Take a look at their drive design below. This will be a metal, 2GB USB drive with their branding engraved. Hi, my name is (insert name here) and I am looking for a price quote. We currently use CD’s to distribute our content (digital catalog, music, software) and want to switch to USB drives. We don’t have a specific budget in mind, but we pay about $1-2 for CD’s. Do you have anything in the same price range? How would you suggest I change what I do so that when I purchase USB drives I get the most out of the money I invest? In other words, if your method is wrong, a $2 USB drive will do you no good. You need to align your promotion / product launch / campaign with the tools you are using. A printed Flash Drive is a tool. You wouldn’t use a screwdriver to nail down a picture, nor would you use a garden hose to bathe your infant. So why do so many people try to use a Flash Drive to substitute for a CD distribution. In his brilliant book, Meatball Sunday, Seth Godin talks about how in order for companies to benefit from “new” marketing (blogs, social media, viral spread of ideas), they need to align their organization to be in sync with this marketing. Same with USB drives. If you are looking to replace your CD distribution with USB drives, you won’t. They will never be cheap enough. So before investing in some custom USB drives, you might want to think about the best way to approach your project, or call me for some ideas. They are always on the house.